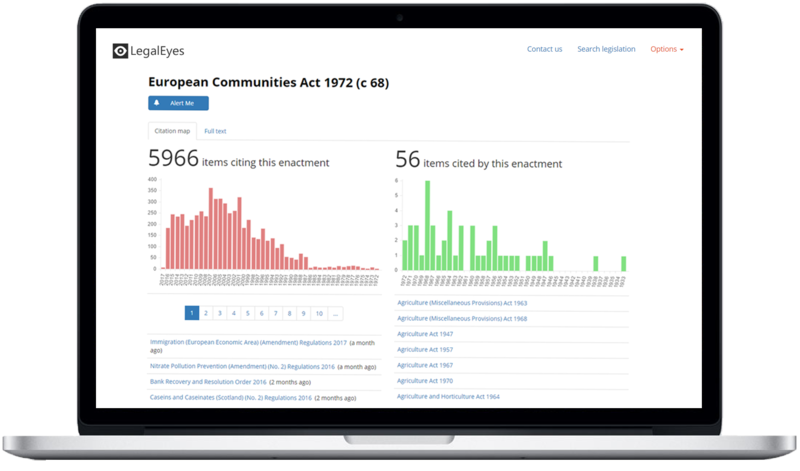 LegalEyes offers an intelligent, automated modular solution for processing legislation and legal texts, identifying citations and consolidating changes in a legislation database. It comprises three modules: eyeCite, eyeComprehend and eyeConsolidate. 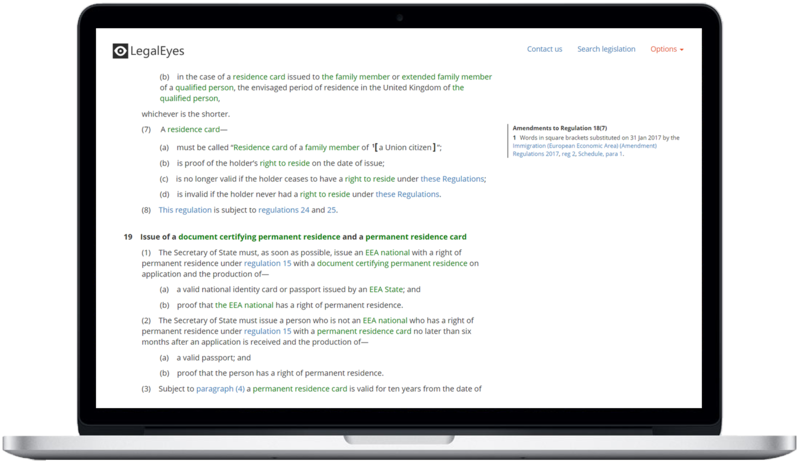 The Enhanced Legislation eyeCite module uses advanced pattern-matching intelligence to identify citations, definitions and other legislative elements in any document. This value-add parsing engine incorporates automatic techniques to enhance statutory materials and other legal texts. The Enhanced Legislation eyeComprehend module automatically converts legislative amendments, commencement dates and appointed day instructions into well-formed XML. It's capable of identfying amendments to non-standard elements, like definitions and headings. 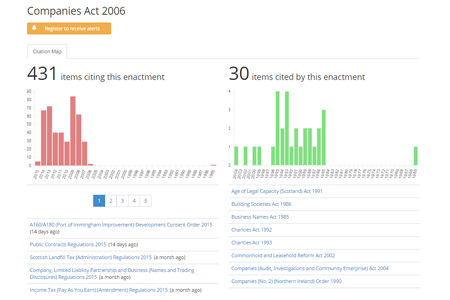 The Enhanced Legislation eyeConsolidate module automatically consolidates amendments in a legislation repository. Detailed annotations are generated for each amendment, capturing its source and target, as well as any introducing provisions. 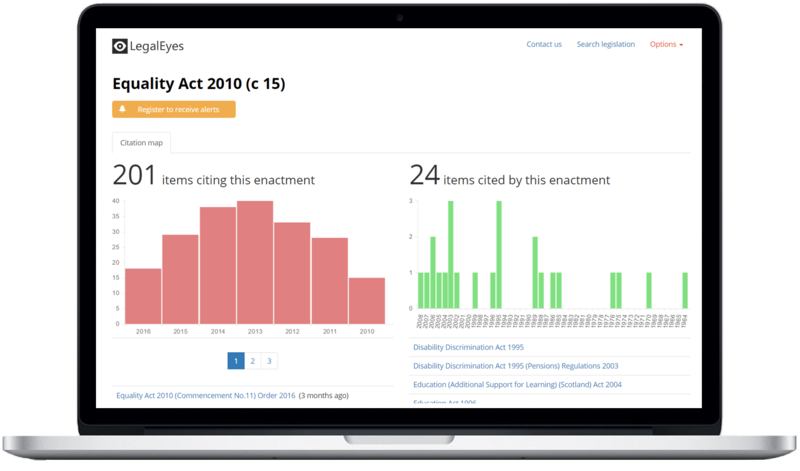 The Enhanced Legislation service transforms the way an organisation processes legislation and legal texts. Please get in touch to discuss how LegalEyes can help your business. 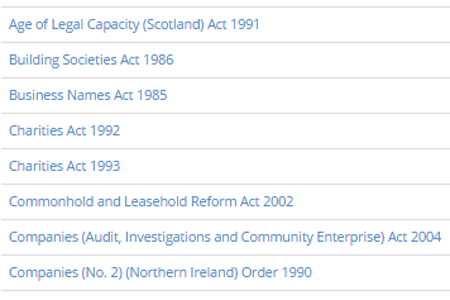 Identifies citations, definitions and other elements in UK legislation. Builds on eyeCITE to convert amendments, initial commencements and appointments into well-formed XML. 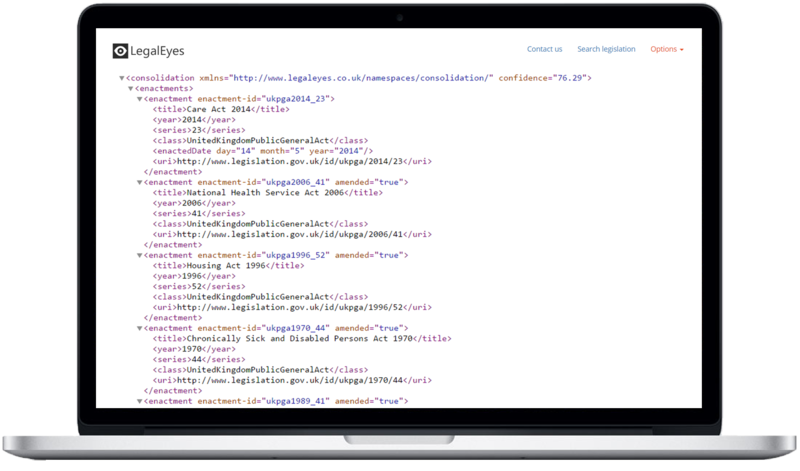 Uses the XML generated by eyeCOMPREHEND to consolidate legal changes in a legislation repository. eyeCITE is a modular value-adding parsing engine that incorporates automatic techniques to enhance legislation published in its original format. In the UK, this means legislation in the UK government's Crown Legislation Markup Language (CLML) published on www.legislation.gov.uk. View eyeCITE-enhanced enactments by clicking below to browse recent documents then viewing the 'Full text' tab in each individual page. 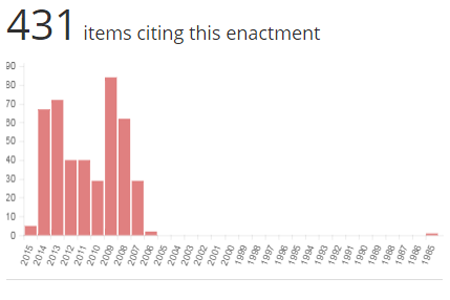 How does eyeCite improve a legislative text? Internal section and Schedule references are automatically identified and marked as hyperlinks. 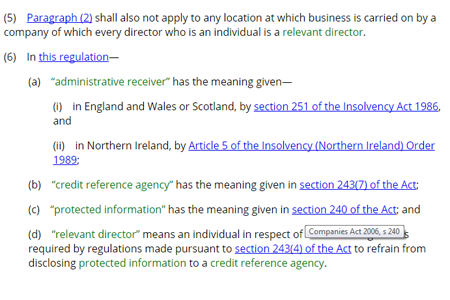 References to other statutes, even the smallest elements, are also identified and marked as hyperlinks. Statutory definitions are identified and can be marked up as hyperlinks to their source. 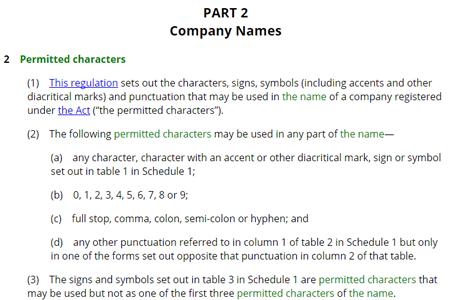 These capabilities mean a reader can move through legislation in an intuitive way, following links to other enactments as they arise, and quickly see which terms have been defined by statute. 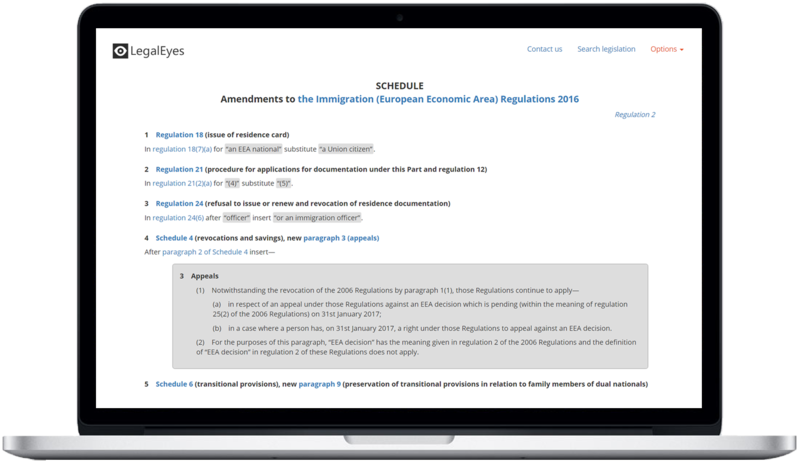 eyeCOMPREHEND builds on the value added to a legislation document by eyeCITE. It identifies initial commencements, appointments and amendments, converting the English text into well-formed valid XML. It captures the source and affected ends of each amendment, identfying definitions and headings as it does so. Where applicable, any introducing provisions are also captured so that a fully detailed annotation can be produced. The initial commencement days specified by an enactment are turned into commencement elements that contain the key dates and information for each commencement. Appointed days in an enactment are turned into appointment elements that contain the key dates and information for each appointment. Amendments made by a legislation document are identified and sufficient information is recorded to allow each to be consolidated in a legislation repository. 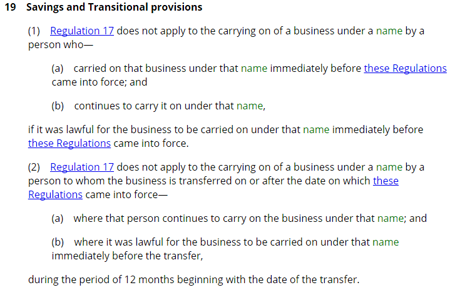 Enactment Repeal (also capable of supporting repeals and revocations subject to exceptions and exclusions). Block Insert (contains the respective BlockAmendment elements). 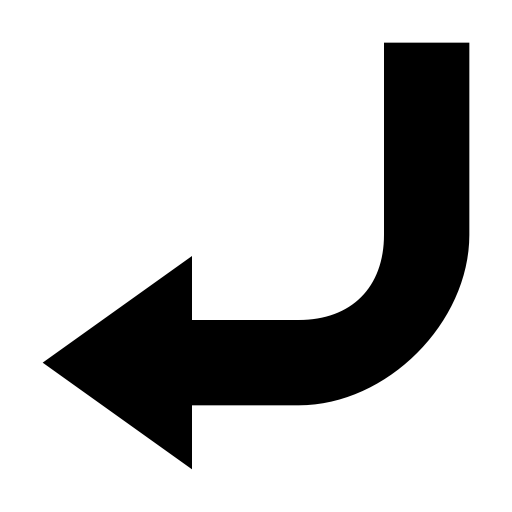 Block Substitution (contains the respective BlockAmendment elements). eyeCONSOLIDATE takes the amendment XML generated by eyeCOMPREHEND and passes it against a well-defined web service to consolidate legal changes in a legislation repository. Each call contains sufficient information to consolidate the amendment into the amended legislation. Resolving the target enactment based on title, year, series number and enactment class. Resolving the target citation to the affected/source unit, heading (part or chapter), provision and sub-provision levels. Resolving definitions and headings within each level of an enactment. Implementing the various methods to apply amendments to each legislation document. An optional capability to group amendments within 'activity lists'. An optional capability to generate past and current views of a provision for editorial validation. In order to make each call, a custom implementation of the consolidation service interface is written for the target legislation repository. The core services allow for the amendments to be passed against this interface to consolidate all of the amendments. What is the citation map? The citation map demonstrates the power of the LegalEyes mark-up engine by showing how every enactment in the statute book refers to every other. See how the entire United Kingdom statute book is connected. Click on the 'Citation map' tab in any enactment. See what's happening to an enactment. Every piece of legislation which cites it is listed; the most recent first. See what a new enactment is affecting. Every piece of legislation cited by it is listed. See how the number of references has changed over time. The number of references per year for period of up to fifty years is provided. Track changes to legislation. 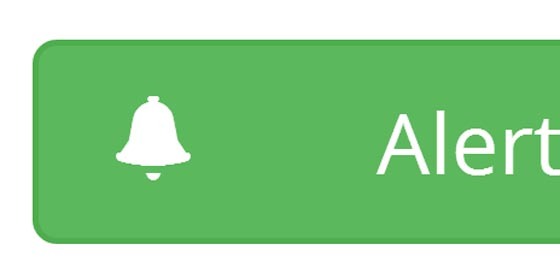 Register your email and set up a list of favourite enactments by clicking the 'Alert me' button for any enactment. You'll receive an email alert whenever something happens to an enactment on your list. These are just some of the services that LegalEyes can provide. We offer consultancy to help customers integrate our services into their systems to ensure they are getting the benefits of automation and enhancing their customers experience. Copyright © LegalEyes 2013-2019. All rights reserved.